Welcome to ‘Footlocker Why do you want to know that’ article. Patients often asked me why I ask questions about other parts of their body and what this has to do with their feet? ‘It’s my bunion, ingrown toenail, heel I have come for!’ they plead. A bit of transparency is required. I don’t see a patient as a pair of feet and it is not possible to isolate the foot from the rest of the body’s functions. There is no doubt that the image of a profession can be coloured by its past and not a little misunderstanding. Many might consider a picture of someone just cutting toenails. Contrast the activities of podiatrists below in the 21st century. We still provide a housecall service, but we also offer a good deal more. The housecall has been a key part of podiatry for decades and provides an important service. The requirements behind a visit are no less important than one in the clinic. The ageing process shows up many foot health faults, most of which relate to preserving ’tissue’. For the word tissue, we can read SKIN. Preventing infection and areas that lead to ulceration. Of course, podiatry as a foot health service has moved on since the sixties and now aligns itself with medical health services. Not only do we recognise change, but most podiatrists work with other professionals in a team. The term multi-disciplinary team has come into vogue but as ever has been shortened to MDT. The profession still emerges from a vocational subject, meaning we study and practise our skills alongside studying our first degree. Contrast this with subjects that do not have a specific end ‘trade or profession’. Podiatry is attractive because it is a doing profession and part of the training is hands-on which makes it all the more relevant. During 2018 the College of Podiatry finally threw off the last vestiges of the past, hidden behind its old name which included chiropody. While the word is synonymous with podiatry, chiropody never acquired degree status. Does this mean those in practice between 1960-1988 are not able to provide quality services? No, this is not true but the change in the range of services has changed. Patients should enquire what services a podiatrist can provide. All podiatrists can offer advice on nail surgery and orthoses (inlays) as well as provide management of key elements we now call core-podiatry. Since 1988 all colleges offered three-year degree courses and advanced areas of podiatry require a Masters Degree with some of the clinical research conducted by PhD doctors and Professors in podiatry. It is important to know that your podiatrist is well trained and has attended a full-time course being instructed by medical doctors, clinical podiatrists and scientists. Therefore, it is equally important to recognise that traditional pedicure has been superceded by someone who will ask more, offer more and hopefully achieve greater success in helping you. It is not that pedicure is bad, but it does not attend the essential medical problems and foot health where needed. A number podiatrists are now independent prescribers which allow us to deal with the key essentials of managing pain, infection and inflammation, to name the key requirements for prescription medicines. The podiatrist needs to identify pain, to protect and improve tissue care, to limit damage created by deformity and restore mobility. In order to do this, we must have sufficient medical knowledge to deal with all of these problems. Without doubt we cross over with the medical speciality of orthopaedics and the key difference, apart from the training, is that we do not deal with emergency medical care of the foot. There may come a time when this may arise as in the USA where a number of podiatrists are part of trauma teams. Majority of the time foot pain is relegated to the foot alone and bears little relationship elsewhere. 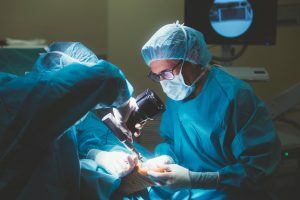 As a foot surgeon who specialised in podiatry, I know that medical problems affect joints, skin, bones and when I recommended surgery I had to take account of what is going on elsewhere. There are many examples that can be cited, from working out if some type of skin treatment or oral medication is causing a skin allergy in the foot, to whether some undiagnosed problem such as diabetes is likely to result in changes in blood supply to the foot or affect the quality of nerve sensation. I found it hard once to clear an infected wound on the foot as the patient had a bowel problem and until this was cleared the foot remained unresponsive. An ingrowing toenail ended up with a mouth bug and until the wound was checked all the usual antibiotics failed. One thing I do know with some sadness is that there is greater pressure on specialists such as myself to consider areas of medicine often not spotted owing to brief GP consultations. A look at Channel 5’s programme about GPs Behind Closed Doors during 2018 showed me how often GPs do not allow the patient to tell the whole story. Even when attending my own GP practice recently, the young GP seemed to be wedded to the 10-minute rule, you can only talk about one problem. Anything else, make another appointment. As a former consultant, I found this hard to swallow! A lady patient in her late sixties presented to clinic and it was only through testing her blood that the true diagnosis behind her rather red face was revealed. 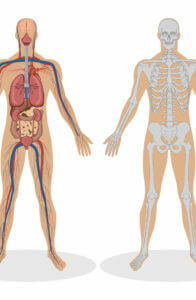 She had a rare condition caused by clumping of clotting cells. Had we performed surgery this could have had fatal consequences around the site of her tourniquet (and of course limb) or to the serious effect the general anaesthetic would have had on her oxygen supply to the brain. One should have found this information in the GP letter. However, the greatest surprise was the fact her husband was a medical doctor and had missed the signs. I have spent most of my career telling patients that I am not a medical doctor but when the chips are down there is no sidestepping where responsibilities are starting to lie. I strongly believe it is not so much that the doctors are completely at fault here but a system derived from a political will to make health savings and changes with unforeseen consequences. Mind you, as a podiatrist what do I know about politics let alone medicine! 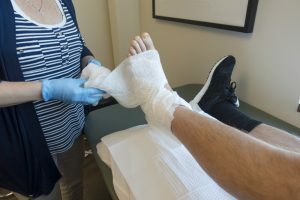 Thanks for reading ‘Why do you want to know that?‘ this article was written by David Tollafield promoting Foot Health Month… next month I delve into burning foot pain. Why not sign up to receive regular news? David no longer practises as a clinician but is always keen to hear from people with foot problem experiences. You can respond to this article below. If you have subscribed and have not heard please do sign up again as we have recently had an administration clean up. April 2019. Consider my new pain series in April, May and June with a downloadable free pain chart for feet.